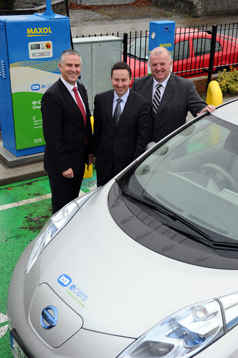 Pictured at the launch of ESB ecars and Maxol's new fast-charge point at Maxol's Riverside service station in Navan, Co. Meath, are from left: Paul Mulvaney, Managing Director ESB ecars, Brian Donaldson, Maxol's General Manager, Marketing and Retail and Paul Sweeney, Operator of Maxol Riverside. ESB ecars and Maxol today, 9th November 2011, officially launched new fast-charge points at Maxol’s Riverside Service Station in Navan, Co. Meath and Maxol Gorey. These will provide electric car drivers with two new convenient charging locations, one on the main Dublin Road, within easy reach of the M3 motorway and the other on the Arklow Road on the N11. These installations are part of the roll out of a network of 30 fast charge points nationwide by ESB ecars and its retail partners. Fast charge points enable drivers to ‘power up’ their electric cars from zero to 80% of their capacity in less than 30 minutes and facilitate journeys between urban centres. The modern Maxol Service Stations are an ideal location for a fast charge facility while also availing of the opportunity to ‘recharge’ in store with a coffee or snack. Standard charge points are also available on site. Maxol which initially led the way in the provision of alternative fuels with the pioneering of biofuel blended petrol and diesel, is working with ESB ecars to create a comprehensive network of fast charge locations with the possibility of more locations being added in the months ahead. The launch of these charge points at Maxol service stations is part of ESB ecars plan to build the charging infrastructure nationwide to meet the Government target of 10% of all vehicles to be electric by 2020. The government has set ambitious targets for the introduction of electric cars in the coming years.